Although we might think that this is an imaginary animal given its huge size, it is indeed an animal that has existed, but died 10.000 years ago, the same period as the mammoths. 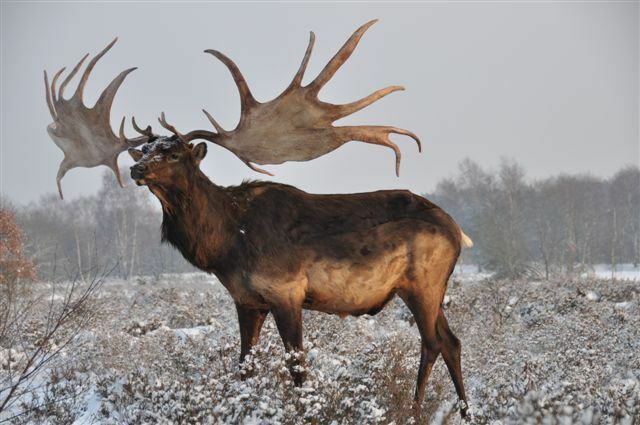 According to paleontological studies, it would be part of the Deer, measuring over 2 m and weighing 700 kg. 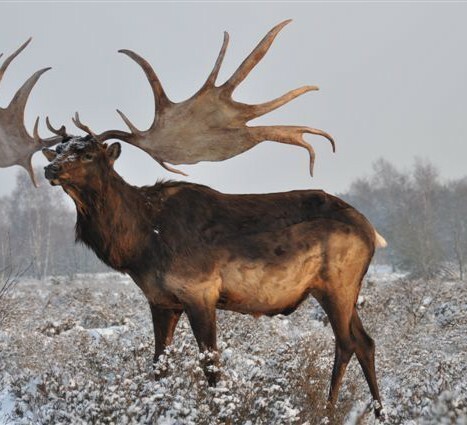 Compared to the current timber elk, wood of these animals are gigantic and 3.70 meters wide. These giant eland existed in Asia, Europe and even in China. But it was in Ireland they were the most abundant. In Irish castles, most of the rooms are decorated with their huge wooden or their fossilized skull. According to the preserved bones, the megaceros had a highly developed dorsal hump. Their appearance would have been closer to that of a deer suede, while their lives would have been exactly that of a current deer. Indeed, paleontology research has revealed that megaceros had the same behavior that deer: rut, fighting between males, or annual wood loss. The megaceros were not animals that attack. Fighting between the males were mostly by intimidation. Because of this docile hand, these animals were the main targets of prehistoric man. Especially as their size, they were a lot of meat, while their bones had been very useful for the various tools of the time. These giants were unable to live in the forest because of their giant wood. Therefore, they lived in the large grassy. The cause of the disappearance of these giant animals is still not determined. In this regard, two opposing theories. The first assumes that they were victims of climate change due to the end of the ice age. The second hypothesize that these were the men and their hunting methods that would have eradicated. The debate continues to this day and scientific theories are outbid.